Back in May 2012, MSV published an exclusive feature on Das Klaussen, re: Perry Klaussen the sleazy blog owner of Hoboken411. The Mile Square's chattering masses wanted to know if the story was true and if Beth Mason's favorite "news site" was in fact departing to the low carb wildnerness of Vermont? As many know, Mayor Zimmer appointed Sacs in place of Johnny "Quarters" Corea. Based on how the Old Guard council members treated Sacs, you would think he was the criminal who scoffed four million quarters from Hoboken's parking meters. In this original email, Perry Klaussen is revealed proving the MSV sourced story in May 2012 had a true basis in fact. Why Klaussen didn't depart when the getting was good is the sole unaswered question. Isn't it better to keep you head down out of Hoboken politics when people exposing truths in Hoboken left and right are sitting on thousands of your emails? 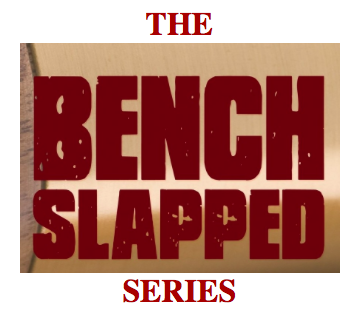 Maybe Perry Klaussen wants to do himself a favor before the August 2012 story he published on "the Hoboken couple" on the Bajardi v Pincus litigation and pull it down and spare himself further humiliation and an appearance next to a judge explaining it. Sock puppets should be shown mercy even if their brains are more akin to scrambled eggs. 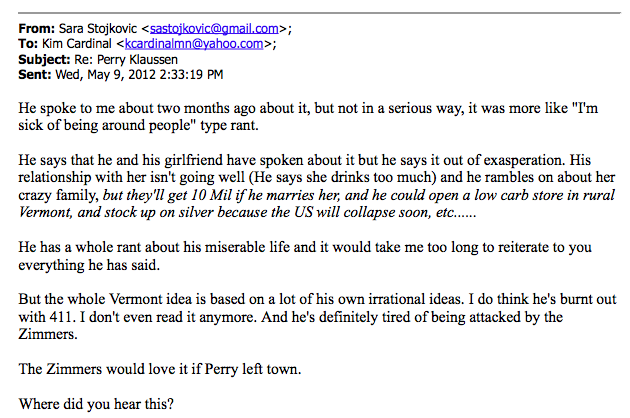 Here's the true, correct email where Das Klaussen's move to Vermont is shown originating with him and gossipy revelations about a lushy girlfriend, how he hates being around people and a somewhat fanciful discussion of a $10,000,000 dowry. Beth Mason's hive: Hoboken411 and Lane "I'm not a political operative" Bajardi on Hoboken's sleaziest dirtbag of a website is shown for wretched hit jobs detailed on Grafix Avenger against former Hoboken Parking and Transportation Director Ian Sacs. Talking Ed Note: Another source tells MSV the so-called girlfriend may be lushy but there's no $10,000,000 end of the rainbow low carb bonanza dowry in waiting. Grafix Avenger knocked it out of the park with this story on the intimate happenings of Beth Mason political operatives on a possible set-up featuring an arrest and coordinated smears on Hoboken411. Perry Klaussen was merely a sock puppet to Lane Bajardi's villanry. Or as the infamous Star Wars line goes among these Beth Mason players, "You will never find a more wretched hive of scum and villainy. We must be cautious." Related: The original MSV story from May 2012: The demise of censorship: Hoboken411 heading to New England, officially ends the dream of a Beth Mason led Hoboken empire.